A very popular snack among our Thai and non-Thai customers. This is the 'Spicy' version which is still fairly mild. We also offer Sesame flavor. Perfect all alone as a crunchy snack. Also, sprinkle over a bowl of fresh jasmine rice, or to add crunch to any Thai soup, stir fry or curry. In southern Thailand, villagers call these "shing shang fish" they are about 3-4 inches before boiling and drying shrinks them to 1-2 inches. The fish are then deep fried and seasoned then oven baked for super crispness and crunchiness. 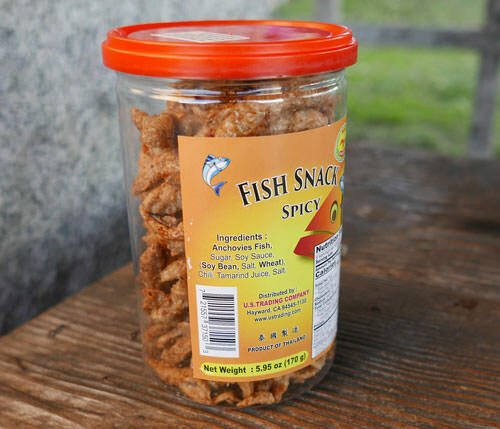 These are dry fish, not greasy at all, and very tasty. The fish are known for high calcium and protein. No fish smell just a tasty natural snack. Comment from Joe in Brodhead, KY. Do not buy the Shing Shang crispy fish unless you want to become addicted to them! I had to order another item from Importfoods so thought that I'd try a container of Shing Shang. First nibble and they were OK, but now that I'm near the bottom of the jar I can?t stop. The texture is mostly crispy and just a bit chewy. They are sweet and at the same time hot, fish taste, but mild. A really neat snack. This Importfoods order was shipped promptly, as always super well packed. Thanks ImportFoods. Packed in a nice tall, strong plastic jar with metal pop top, and resealable plastic lid. Ingredients: anchovy fish, sugar, soy sauce, chilli, tamarind, salt.